Not all the news about the economy in general-and as related to the decorative arts and painting in particular-is bad. Late last year Skinner in Boston auctioned a miniature of George Washington by Robert Field that fetched more than $300,000-some ten times its presale estimate. According to the portrait miniature specialist Elle Shushan of Philadelphia, who was the successful bidder on behalf of the Yale University Art Gallery, this is the second or third highest price ever paid for an American portrait miniature. The record ($1,216,000) was set in the palmier days of early 2001 for another Washington miniature, that one painted from life by John Ramage in 1789 and now in a private collection. Field’s Washington was painted posthumously but has an important and impeccable provenance. To mark the anniversary of her husband’s death in 1799, Martha Washington commissioned Field, one of the most highly sought after miniaturists of his day, to paint eight portraits of her husband for presentation to friends and family. Six show him in civilian dress, while two depict him as a general in full uniform. These last were given to Martha’s step-granddaughters, Anne Calvert Stuart and Sarah “Sally” Stuart. The present miniature-which includes a woven lock of Washington’s hair in the locket case-descended in Sally’s family. Although Field may have visited Washington at Mount Vernon in 1798, the portraits painted for the Stuart girls were likely based in large part on a miniature by Walter Robertson, which Field apparently purchased from him in 1795. Confirming that even then a Washington miniature commanded a premium, Field wrote to his friend and patron Robert Gilmor Jr. of Baltimore: Robertson’s portrait “is as good a likeness and as fine a piece of painting as I ever saw….I should be glad to purchase if the price he asks was not so extravagant-(viz. 1000 Dolls)”-more than $17,000 today. Robin Jaffee Frank, a curator of American paintings at the Yale University Art Gallery, points out Field’s crisp painting of the uniform in the newly acquired likeness, while also noting that Washington’s face is “tenderer-more heartfelt” than is usual in his portraits-as befits a memento for a loved one. For Yale the acquisition is the more invaluable because the gallery already owns a miniature of Martha Washington commissioned from Field at the same time and also intended for a family member; in it he has rendered her with “affection and insight” and captured a sense of her fragility at a time of great loss. The two miniatures will be rejoined for the first time when the traveling exhibition Life, Liberty, and the Pursuit of Happiness: American Art from the Yale University Art Gallery opens at the Seattle Art Museum on February 26. Intended for personal contemplation when they were painted, portrait miniatures retain an intimate hold on collectors today. Indeed, Shushan says, American miniatures sell first on the basis of the sitter-for the feeling of connection one has through knowing as much about him or her as possible, which is, of course, one reason why George and Martha Washington will always bring a higher price than almost any other subject. Interestingly, Shushan says, European miniatures sell more on the basis of the artist or the quality of the painting. To be had for as little as $350, portrait miniatures can be considered woefully undervalued today, given the enormous degree of pleasure and satisfaction that comes from holding and contemplating these tiny connections to the American past. Update: As we go to press Skinner has announced that the Field miniature given to Anne Stuart has surfaced and will be offered at auction on February 15. 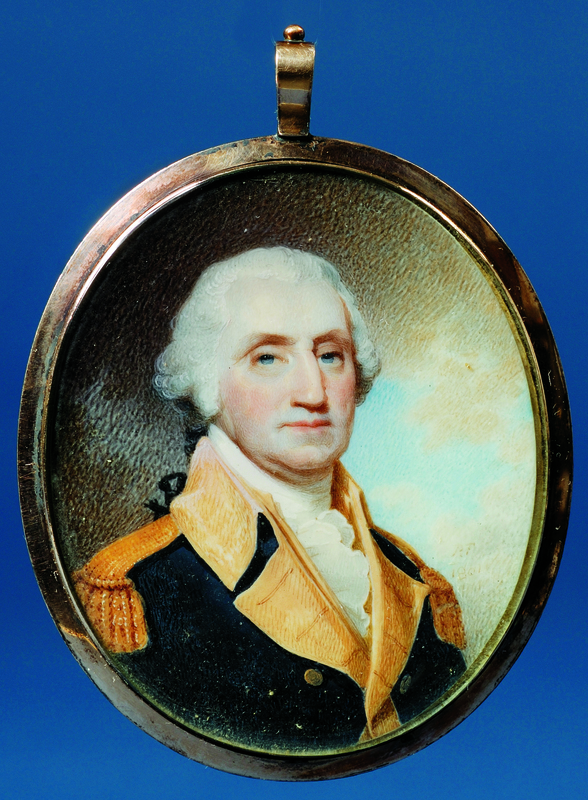 Portrait miniature of George Washington by Robert Field (c. 1769-1819), 1801. Initialed and dated “RF 1801” at lower right. Watercolor on ivory in gilt-brass locket, 2 ¾ by 2 ½ inches. Yale University Art Gallery, New Haven; photographs by courtesy of Skinner, Boston. Reverse of the locket with a lock of Washington’s hair overlaid with “GW” in gold. The original red leather case survives with the locket.